While playing Progressive Blackjack, you have one-up on the dealer because he has to always stand on any hand totaling 17 or more. You may split your hand whenever your first two cards area a pair, but you cannot re-split. Split aces receive just one more card each, and if that card happens to be a ten point card, the hand is counted as 21, not as blackjack. If you think you would like to double down this is an option so long as your two cards total 9, 10, or 11. The double down wager is an amount equal to your original wager. Insurance can be purchased on a dealer ace for a cost equal to half of your initial bet. There is no option to surrender your hand in Progressive Blackjack. In European Blackjack your initial bet is constrained to a range of 2-200 USD/GPB/Euro. All wagers are made using chips in denominations of either 2, 5, 25, or 100. When you win a hand, your payout depends on the type of win. Blackjack pays 3:2, and all other wins pay even money at 1:1. Insurance bets pay 2:1 if the dealer in fact has blackjack. All bets push in the event of a tie. When you first have a look at Vegas Technology’s Progressive Blackjack game, you will first notice how stunning and life-like the graphics are. If you have already played one before, you will know exactly what we mean. This game looks fantastic. The plush, red velvet table is inlaid with gold filigree and surrounded by a polished walnut rim. 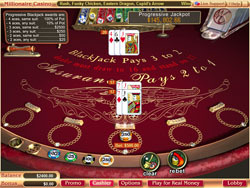 The gleaming card shoes and chip tray hover brightly at the top of the screen. When you deal, cards fly magically out of the shoe into perfect alignment on the table. You can turn off the animations if you have an older machine, but they don’t slow things down very much. The game is great on the eyes, and very easy to play – you will never be left wondering where to click next! Don’t skimp on the Progressive Side Bet! It’s only one credit, everyone can afford that who is gambling online, and anyway the Progressive Jackpot is the whole point of this particular Blackjack game. This bet will definitely not pay out every hand, and maybe not even every 10 hands, but when it does, it pays at least 25, so that gives you 25 hands to break even, but it could potentially pay tens of thousands, so throw in the chip and cross your fingers! Like all Vegas Technology Blackjack games, Progressive Blackjack really delivers. The game is worth playing just for the chance of hitting the huge Progressive Jackpot, but even if it weren’t for that great feature, we would still love this one. The graphics are stellar, and the game plays as smooth as a Cuban cigar. We couldn’t find a single thing wrong with this game – can you?